Term 1 has flown by and was quite a shock to the system with the volume of homework increasing from primary school, settling into a new school, an earlier start time and a later finish, new routines. Plus making time for all the extra mural activities…and that’s just me! Let alone my poor child! But he’s a champion. Always willing to try something new with a smile on his face and boundless energy. But even his energy was quite low towards the end of a busy term but after two weeks of holiday with a good mix of friends, holiday programmes and time at home to chill out, we’re looking forward to being a bit more organised and prepared for Term 2. 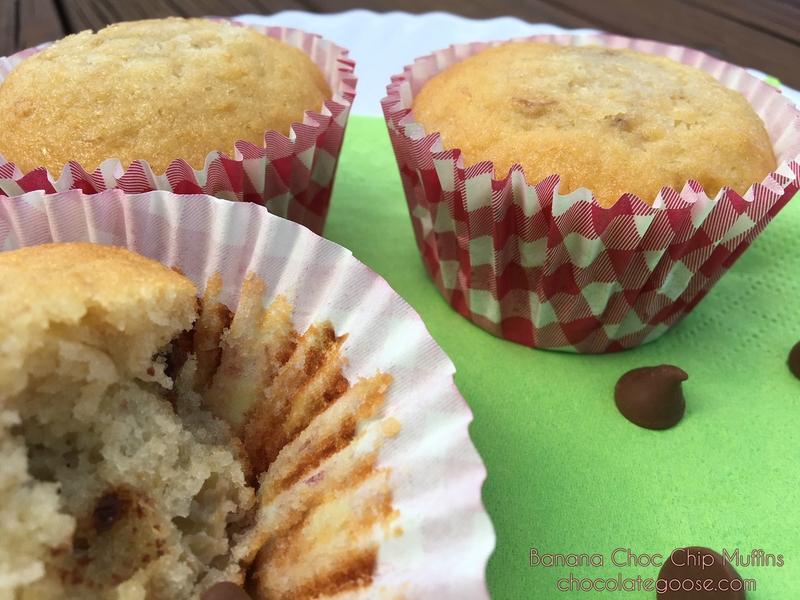 I even managed to use the bananas that has been relaxing in the fruit bowl and whipped up a batch of banana choc chip muffins. As with any muffin recipe, the less you mix it together, and the fresher you eat them, the more happy you are likely to be with the end result. I ignore any recipes that call for creaming butter and sugar first as these are more like cupcakes and not true muffins. And I also prefer recipes that use wheat flours or bran to include more roughage and fibre in our diets. None of us have any colon or gluten issues, thankfully, but if you do, substitute the flour for a flour of your choice. The attraction for me is that because muffins are so quick and easy to make, the ingredients can be laid out the night before, then quickly combined before school and then being popped into the oven. Warm muffins for breakfast are simply divine, but also a good lunch box filler for later in the day. And of course, as there isn’t any fiddly icing or decoration, unless you feel so inclined, they are easy to freeze to enjoy another day. If you do decide to freeze a batch or any leftovers, allow them to cool a little before wrapping them individually in tin foil or my personal preference, pack them into an airtight container and place them into the freezer. Doing this while they’re still warm preserves a little of the moisture so they aren’t dry once defrosted. A frozen muffin in a lunch box is fully defrosted and fresh by morning tea or lunch time. Pre-heat oven to 200°C (400°F) and grease or line normal-size muffin trays (not Texas or mini size). Sift dry ingredients together and add bran left behind in the sieve. Whisk egg, milk and oil together and mix into dry ingredients only until flour is moistened; batter should still be lumpy. Stir through the mashed banana and choc chips being careful not to overmix. Spoon into the prepared muffin trays, filling only two-thirds full. Bake for 15 – 20 minutes until golden brown. Test by pressing gently on the top of the muffin with your finger. If it springs back, the muffins are ready. Remove from the oven and allow to cool in the tray for a couple of minutes before transferring to a cooling rack. * If using the choc chips, I sometimes reduce the volume of sugar to 100 – 150 ml castor sugar. **½ a cup of choc chips might be too much for some. Reduce quantity to a ¼ cup if preferred.